Nationwide protests are being organized for 5pm today in response to Donald Trump forcing Jeff Sessions out as Attorney General. These protests are not about sympathy for Sessions at all – they are about protecting the rule of law and Trump’s attempts to undermine and ultimately stop the Mueller probe. Ring of Fire’s Farron Cousins discusses Sessions’ exit and what it could mean for the investigation. Shortly after the mid-terms concluded, or at least most of the races concluded on Wednesday, Donald Trump announced that Matthew Whitaker was going to be the new acting Attorney General for the United States because he had asked Jeff Sessions to resign. Now, Donald Trump has had beef against Jeff Sessions since the day that Jeff Sessions recused himself from the Muller investigation. In fact, that whole thing is the reason we even had to have a special prosecutor in the first place, because Jeff Sessions couldn’t and wouldn’t do it. Literally, the one good thing this man ever did in office, and he just paid for it with his job. Had he been corrupt as well, or least as corrupt as every other member of this administration in the cabinet, he’d still have a job. But again, decides to do one good thing in his life and then pays for it with the best job he ever had. But nonetheless, in response to the firing of Sessions, there are mass protests taking place today at 5:00pm local time, depending on where your timezone is. It’s supposed to be 5:00pm across the board. But these protests are not to mourn the loss of Jeff Sessions, no. These protests are to protect Robert Muller and the office of the special prosecutor’s investigation into Donald Trump. Because here’s the thing, the reason Jeff Sessions had to go, again, is because he recused himself and Donald Trump wants this investigation to go away. He had repeatedly called on Sessions to end. But, oh no, he’s recused himself. He’s a coward. He’s weak. He’s harmful to this administration. Donald Trump hated Jeff Sessions, because of that on decision, so he decided to get rid of him, replaces him with Sessions’ chief of staff, Matthew Whitaker, a guy who actually wrote an op-ed explaining exactly how he would get rid of Robert Muller just a year and a half ago. And here is exactly what he’d do. He wants to defund it. He wants to pull all the money out of it, so that they can’t go any further than they already have. There’s nothing illegal about that, and there’s certainly nothing that’s gonna show the public like, “Well, I didn’t end it. I just had to cut their funding because it’s costing us so damn much money.” Something Donald Trump himself has been tweeting about. So, they think they can use this as a better avenue to halt the investigation without, technically, halting it. Well, the good news is, I’m pretty sure you could find plenty of wealthy donors out there willing to give some money to help this investigation continue. I mean, after all, George Soros pays all the protestors, so I’m sure he could pay enough to keep this investigation going. I’m kidding about that, but that’s just how silly republican conspiracy theories get. But nonetheless, people are afraid right now and they have every right to be. 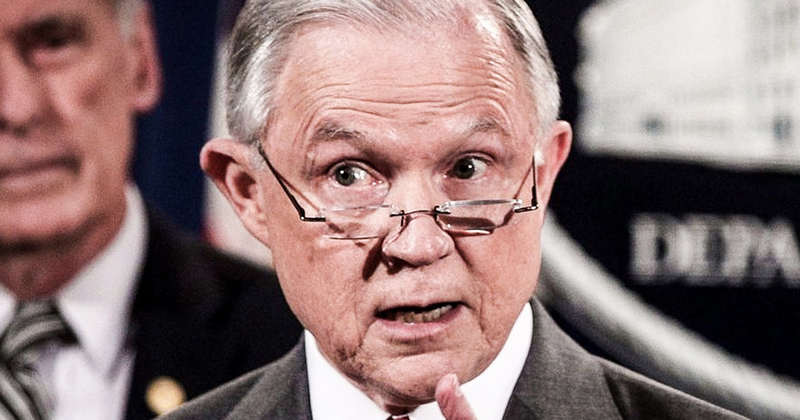 We are witnessing what many have called the slow motion Saturday night massacre, getting rid of Jeff Sessions was just the first step. And remember, the reason Rod Rosenstein was even in charge of that investigation was because Session recused himself. But now, Whitaker’s in charge. Rosenstein is no longer overseeing it, and Whitaker is going to have full control over what happens from this point forward. He should recuses himself, but he won’t recuse himself. Because he know if he does, that’s the end of his job as well. These protests are important. These protests that are happening today show us that the American public is not going to sit by while this administration continues to dismantle the rule of law in the United States.